Massive Ad Screens at Sun In Sands Roundabout? There’s a plan afoot to build a Hack Space in South London. It’s not Blackheath specifically – currently it’s known as the Brixton Tinker Space, but I thought it was worth sharing as it could be a fantastic place to learn new skills and meet new people. A hack space is a workspace where members pay a few pounds every month to go and work on their personal projects, inventions and designs. There’s an amazing one in Hackney, but nothing in South London yet. Think of it as an allotment for your mind. I met up with them in a pub in Brixton for one of their first meetings. They’re still looking for a space to use, and it doesn’t have to be in Brixton, so if anyone here is interested, or knows of a suitable location at a reasonable rent, please drop them a line. And they’re also on Twitter and Facebook, and Google Groups. Some of the organisers are also involved in a Mini Maker Faire in Elephant & Castle taking place on 6th July. It’s free to attend, and could be a great introduction to all this making business. Based on this project – check out their much more impressive video at the bottom of the page. UPDATE: See the bottom of this post – the mystery appears to be solved. I am trying to trace the location of a painting of “Church near Blackheath“, painted by Elwin Hawthorne and I was wondering if you might be able to help identify the location? His notes for the picture say:- “Vanbrugh Park from the Standard public house”. 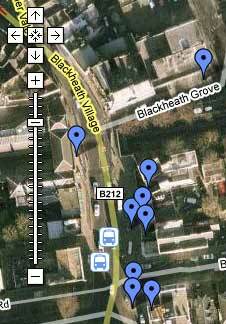 Looking at Streetview, I wonder whether there was a church on the site of what is now Blackheath High School, Senior School? Possibly the church was destroyed during the war. Below is where I think he’s referring to on Google Street View, but the outline of the building looks different to me. Any ideas? 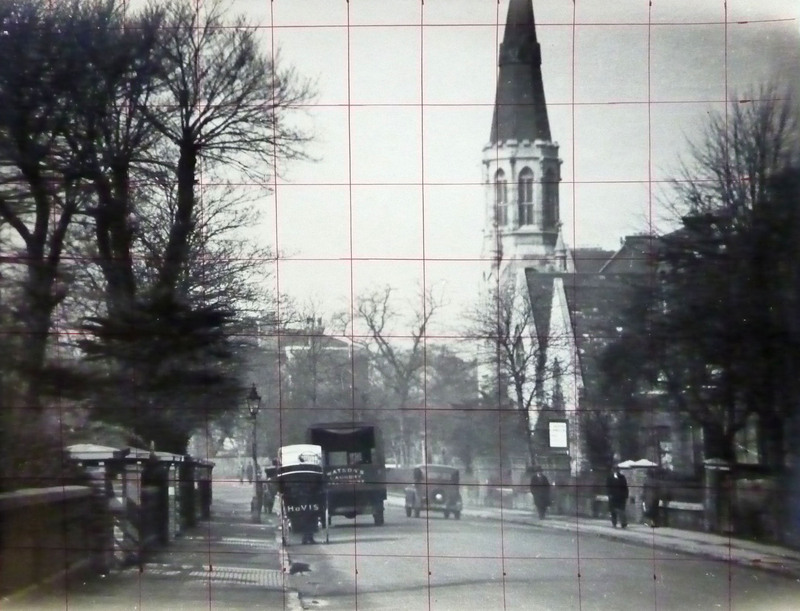 Alan has been sent a photograph of the scene by the artist’s son (also called Elwin Hawthorne). It is his Father’s photograph of the scene from which he painted his picture, hence the “squaring up” lines across the image. Elwin was one of a group of artists known as the East London Group – see Alan’s website here. With a bit of help from a “local”, Nick Sack, I think we may have identified the site of the church on Vanbrugh Park; it looks as if it is on the site of what is now the Blackheath Senior School which used to be the Church Army Chapel. I have attached two screenshots from Streetview which show the road outside the School and, in that image, you can just make out the presence of a redbrick house behind the trees on the right; in the other shot, you will see a shot of the building frontage which is extremely similar to that represented in the painting, although it now appears as if one half of what was most likely a double fronted building has disappeared, along with the church next door! It would be fascinating to find out a bit more about the history of the area; whether it was hit during the war and, if so, what effect did it have in the area? I think that what we need now is an identification of the actual church’s name and the history that goes with the area! The streetview shots he mentions are the same as the location shown in the initial post above.